A massive fight broke out on Kiev’s landmark Independence Square (Maidan) on Tuesday night, with shots and explosives being heard, according to Ukrainian media. There are reports of injuries. 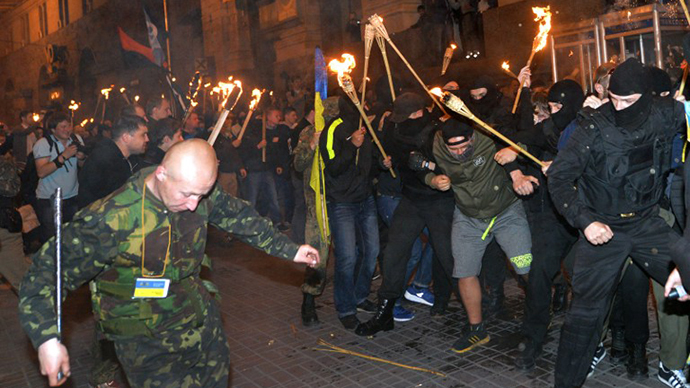 Eye witnesses described over 100 people, reportedly members of the far-right Social-National Assembly, marching with burning torches towards Maidan – the epicenter of the massive uprising that removed former President Yanukovich from power. The marchers came to commemorate those killed during anti-government protests in December-February. Maidan self-defense units blocked the rally at the barricades across from the main post office, prompting a massive fight. 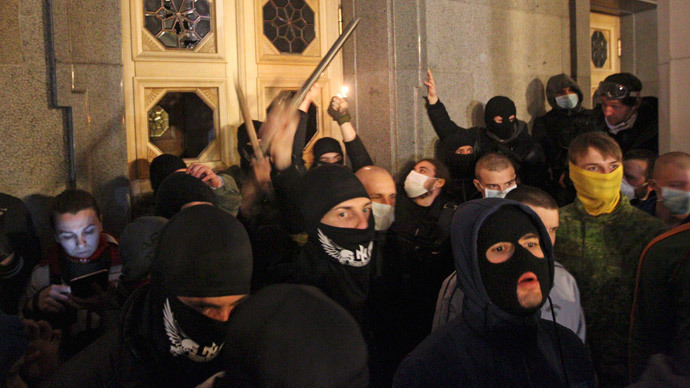 The far-right radicals reportedly used firecrackers, traumatic guns, and tear gas. Many of them carried bats and sticks. There are reports of injuries, according to Ukrainian media. One of the tents at Maidan caught fire, and the blazes were swiftly extinguished. Witnesses reported ambulances arriving at the scene. Eventually, the self-defense units allowed the rally to pass through. 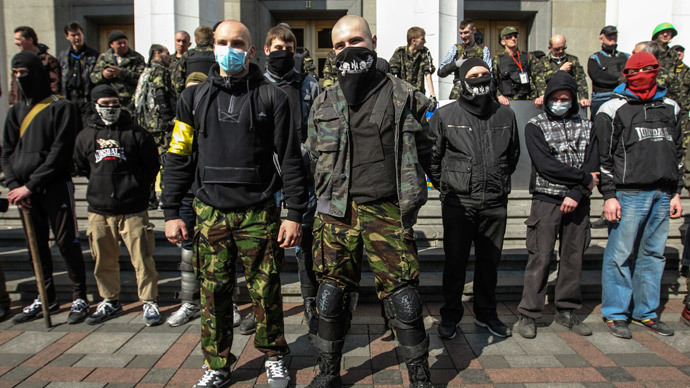 The march then began to move towards Ukrainian Parliament, local television channels reported. 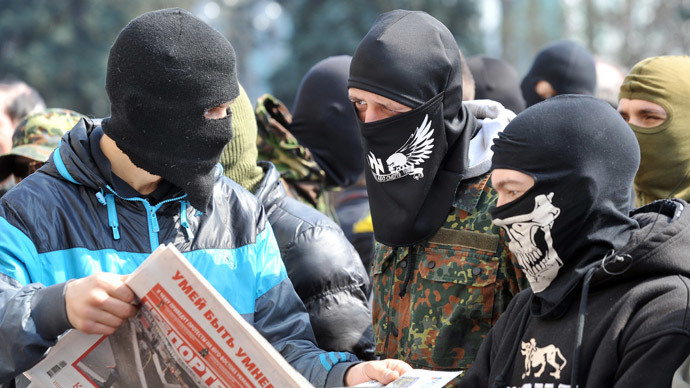 Nationalist sentiment has been prevalent in Ukraine throughout the ongoing crisis. 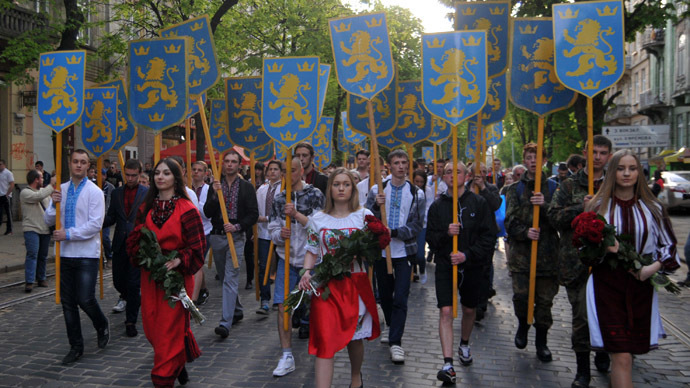 On Sunday, hundreds took part in a march in the western city of Lvov to mark the anniversary of the formation of the 'Galician' Ukrainian SS division, which fought for the Nazis against the Soviet Union during World War II.